Japan and the European Union agreed Monday to complete respective domestic procedures before the end of the year to ratify a free trade agreement by March as planned. 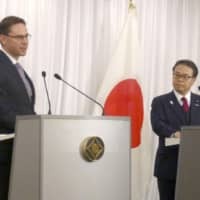 “The Japan-EU EPA (economic partnership agreement) is strategically important,” Foreign Minister Taro Kono said at a joint news appearance after the meeting. “We agreed to make efforts to end domestic processes before the year ends so both parties can feel the benefits as soon as possible,” the minister said alongside industry minister Hiroshige Seko, who also represented Japan. The inaugural meeting in Tokyo signaled a joint push by Japan and the European Union to counter protectionism as trade tension spikes between the United States and China, the world’s two largest economies. Japan and the EU agreed to launch the high-level dialogue at their summit in Tokyo in July, during which they also signed a free trade accord following five years of negotiations. 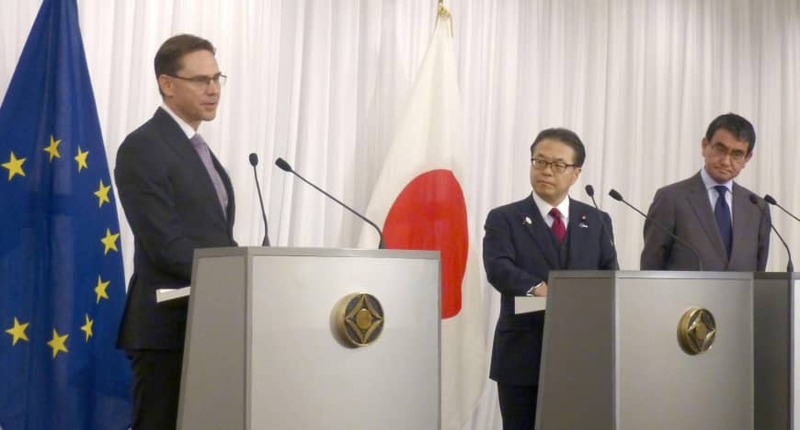 “This is just a beginning for closer, very tangible, concrete cooperation between Japan and the European Union,” Jyrki Katainen, vice president of the European Commission in charge of jobs, growth and investment, told the news conference. Japan and the European Union share a common challenge in negotiating with the United States over trade, amid Donald Trump’s threat of auto tariffs. The government of Prime Minister Shinzo Abe has been promoting a “free and open” Indo-Pacific strategy that calls for the development of high-quality, sustainable infrastructure and a rules-based order.